I'd like to schedule a personal consultation. Not a Virginian, but have a question about Virginia estates, trusts, or probate. email I send you. Text me anytime. …OR CLICK HERE TO EMAIL ME. My Northern Virginia offices are in One Colonial Place, located in the Clarendon/Court House area of Arlington. 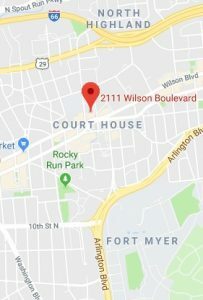 Convenient parking is available beneath the building complex; the garage entrance is under 2101 Wilson Boulevard; turn right as you enter the Colonial Place driveway. You may also enter the garage from Key Boulevard, in the back of the Colonial Place complex. Follow the interior signs to “2111 Parking,” which is at the opposite end of the garage from the entrances and exits. Less expensive parking is available at the 2100 Clarendon Boulevard garage under the Arlington County office building, about a block and a half away, or at the 4-hour parking spaces located on N. Veitch Street. The Courthouse Metro subway station escalators are right across Wilson Boulevard at the corner of N. Uhle Street.